The new Firefox – better than Chrome? For quite a while, Firefox was my default browser. I’ve been using Chrome as my default for several years now and I really like it. 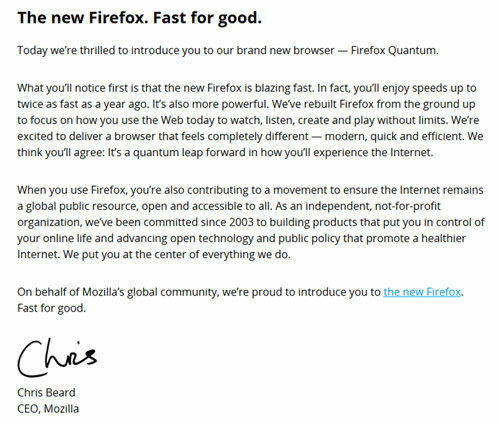 But the new super-fast version of Firefox might be tempting. What are the pros and cons for using the new Firefox? First, it’s just faster. 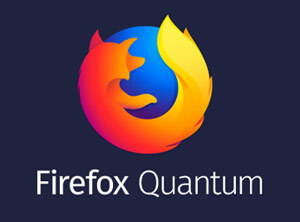 I have not run any scientific side-by-side tests comparing the speed to older versions of Firefox, but it’s clear to me that the new Quantum is absolutely, noticeably faster. I have Firefox set to open a certain set of websites (11 sites, each one in its own tab). Until now, I’ve waited for all those pages to load each time so I know about how long it takes. Now, it takes much less time. You’ll notice the difference. Second, it uses less memory. This means if you’re running Firefox with a bunch of tabs open, it won’t slow down the other programs running on your computer. The developers claim that Firefox Quantum uses 30% less memory than Chrome uses (I have not verified that claim). Third, it just looks cool. The new Firefox has a new design that leans toward “minimalistic” which I like. But it’s more than just a change in the appearance. With the newer displays using high-resolution, this Firefox works better and appears “crisper” on the screen. Some extensions might not work. I have a client who loves an extension that puts her bookmarks in 3 rows right there at the top of the screen. With the new Firefox, that no longer works. On the other hand, some extensions that did not work previously with Firefox might work with the new version. I recently wrote about QClean, a browser extension that blocks Facebook ads (such as Sponsored Posts). At the time, that extension worked fine in Chrome but not in Firefox. But it works in the new Firefox. And a lot of developers are working on getting their extensions updated so they too will work going forward with Firefox. There are other changes that add new benefits (such as the new “Library” feature, and the built-in ability to take screenshots) which add to the allure of Firefox Quantum. Are these changes enough to lure me away from Chrome and change my default browser to Firefox? The jury is still out on that, but I definitely like these new changes. Have you tried Waterfox by Mozilla? Tried that on a client and couldn’t get it to run. Haven’t really pursued it though.